Our times are a little different this month, so if you’re feeling crafty feel free to drop by Inkling (2917 1/2 N. Broadway) tomorrow night from 6 to 8! We’ll be teaching two different envelope crafts! 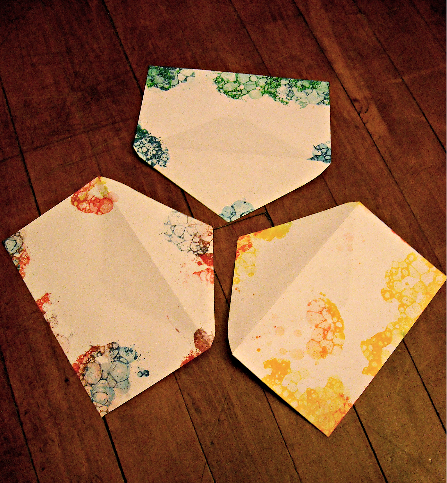 With just a little soap, water, and food coloring, we’ll dye envelopes by popping the color right onto them! What says spring like a little color? We’ll also be making the most of those beautiful, neglected patterns found on the insides of security envelopes. Bring your old security envelopes and get ready for some upcycling! As usual, feel free to bring your own projects to work on or just come to hang out. Refreshments will be provided! Want timely event updates on Facebook? Check out our page! If you “like” us, I promise we’ll like you back. This entry was written by Zachary, posted on May 19, 2011 at 9:43 pm, filed under Chicago. Bookmark the permalink. Follow any comments here with the RSS feed for this post. Post a comment or leave a trackback: Trackback URL.